May 19, 2017 by Beeraj Patel, Esq. In America, a green card permits a foreign national to permanently live and work in the U.S. For many immigrants and their families, becoming a green card holder is a major accomplishment that comes with a plethora of benefits. Acquiring a green card is the first step towards becoming a full U.S. citizen. It also presents other perks like the ability to sponsor relatives who would like to apply for their own green cards. 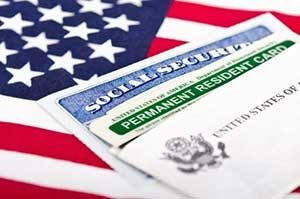 Due to the freedoms and opportunities available in America, the green card program has become increasingly popular. Nearly a million people received green cards in 2013 alone. While there have always been immigrants, the green card program is a fairly new concept with interesting origins. The green card, referred to as the Permanent Resident Card by U.S. Citizen and Immigration Services (USCIS), has changed colors and designs over the years. It only recently became green again in 2010 after being white, pink, beige, and blue in the past. The card has also taken several names, including the Resident Alien Card or Alien Registration Receipt Card. Despite the name, the Permanent Resident Card does expire after 10 years. However, legal residents may apply for U.S. citizenship after five years. The first green card wasn’t green at all, but white. These cards were the product of the Alien Registration Act of 1940. Also known as the Smith Act, this U.S. federal law was passed by Congress on June 29th, 1940 and made it illegal for anyone in the United States to assist in the overthrow of the U.S. government. This new law also required all U.S. aliens over 14 years old to file a statement containing their personal and occupational status and political beliefs. In just four short months nearly 5 million aliens had successfully registered. Green cards were created as a national defense measure and did not discriminate between illegal and legal immigrants. To obtain a card, these immigrants would have to fill out registration forms at the post office, who then would forward the documents to the Immigration and Naturalization Service (INS). Once processed, the immigrants were sent receipt forms in the mail. Known as AR-3 forms, these white receipts allowed immigrants to prove their registered status to police, government officials, and similar individuals. After World War II, many immigrants flocked to the U.S. in search of the American Dream. Due to a surge of traffic, a change in the system was made to streamline the green card program. Alien registration was moved from post offices directly to their port of entry. Immigrants would receive Form I-151, also known as the Alien Registration Receipt Card. This card was made of a pale green paper, making it the first official “green” card. Each type of immigrant was also processed by different permits so that the INS could process registration forms more efficiently. There were several main types of immigrants that determined the type of permit each person would receive. These include students, teachers, and workers. Depending on your reason for entering the U.S., your green card would show your status. However, immigrants without legal basis to remain in America were removed or required to leave. Immigrants who had a valid reason to claim residency in the U.S. were sent the proper documentation to prove their status. Aliens who could not prove legal admission in the U.S. were considered to have violated U.S. immigration laws and were subject to prosecution. As more and more aliens became desperate to immigrate to the United States, fraud greatly increased. By the 1950s, counterfeit green cards were becoming a major problem. The Internal Security Act of 1950 further aggravated the issue. To deter fraud, the INS redesigned the green card between 1952 and 1977 a total of 17 times. Before this point, legal immigrants to the U.S. were free to exchange an AR-3 form for an I-151 and become permanent residents. Those without legal status could not. This change significantly increased security but made counterfeit green cards a commodity. In 1977, a new green card was developed that was believed to be more resistant to counterfeit. These machine-verifiable cards were made of durable plastic, unlike the paper cards issued previously. These new cards also required a fingerprint, signature, and an A-number that enhanced the identification process. INS went on to rename these green cards from Form 1-551 to Resident Alien Card. Cards issued between 1977 and August 1989 did not have expiration dates or document numbers. This made these green cards valid indefinitely. After complaints from employers, the INS changed the green card again in 1989 and 1997. In 2004, a seal and hologram were added to the front of the card by the Department of Homeland Security. Although the green card has seen many changes over the decades, the term “green card” has remained. The most recent update to the green card was made in May 2010 when it was once again changed to a green color. These cards also feature the latest in security technology to fight counterfeit, including measures like laser-engraved fingerprints and embedded personal data. Unlike the green cards before them, these cutting-edge pieces of plastic also contain high-resolution micro-images, as well as radio-frequency identification (RFID). Today it’s very difficult to illegally replicate these cards. By law, the American government gives approximately 50,000 green cards each year through the Green Card Program, also known as the Diversity Immigrant Visa Program. As a green card holder, you have the right to live permanently in the U.S. as long as you do not commit any crimes that go against immigration law. You also have the right to work in the U.S. at a legal job of your choosing according to your qualifications. You’ll also be protected by all U.S. laws as well as those in your local jurisdiction and state of residence. While the process to get a green card has changed since the start, the reach for the ‘American Dream’ has remained steady.